Mongolian Beef gets new life in this super easy Instant Pot recipe that will make even driving to PF Chang’s not worth it. This pressure cooker recipe, with conversions for a slow cooker and a 30 minute stove top meal, is perfect no matter what you have going on in your kitchen. Instant Pot Mongolian Beef, Yum! Mongolian beef is one of the easier homemade copycat meals you can make. With a tangy but sweet Asian sauce at the helm, you know its going to be a perfect homemade dinner that will have your family begging for more. Making an easy Mongolian Beef Recipe is probably the quickest way to get this authentic and perfect meal to your table. Because its done with a pressure cooker, you get the ease and the convenience of a one pot meal, easy clean up, and tender meat all in one. Ready for dessert after? Try this Instant Pot Cheesecake recipe! A pressure cooker simply uses pressure to raise the steam and boiling point of food in order to help it cook extremely fast. Its great for meats because it really brings them up tender quite quickly. What used to take hours to slow cook in the oven now can be done quickly and efficiently for a busy family. If you do not have a pressure cooker, there are many favorites out there but one o the more popular ones that have easy to understand buttons is the Instant Pot . This recipe centers around using that one but feel free to use your own. If working with an Instant Pot confuses you, I have an Instant Pot Guide right here. Mongolian beef is a dish served in Chinese-American restaurants consisting of sliced beef, typically flank steak, and stir-fried with vegetables in a savory brown sauce, usually made with hoisin sauce, soy sauce, and chili peppers. The beef is commonly paired with scallions or mixed vegetables and is often not spicy. Place oil, beef, garlic and ginger into the instant pot. Set the instant pot to saute and cook the meat until brown. Add soy sauce, water, sugar and mix well. Place the top on the pressure cooker and close the pressure release valve. Set the instant pot to manual, high pressure for 7 minutes. When cooking cycle is complete, quick release the steam and open the lid. Stir in the cornstarch and water mixture and let set for about 5 minutes. TIP: Similar to the Instant Pot Orange Chicken Recipe, you have to use the cornstarch to thicken up the sauce. To thicken sauces in a pressure cooker, open and immediately dump in the cornstarch and water, then stir. Instant pot makes your food really hot, so let it set for a few minutes to thicken up. Some people prefer to saute again, let it come to a boil and that will also thicken the sauce, the choice is up to you. Serve over white rice (I prefer Jasmine) topped with chopped green onions for color and additional flavor. Not ready to venture with an Instant pot quite yet? Use your trusty slow cooker to make this Mississippi Roast. 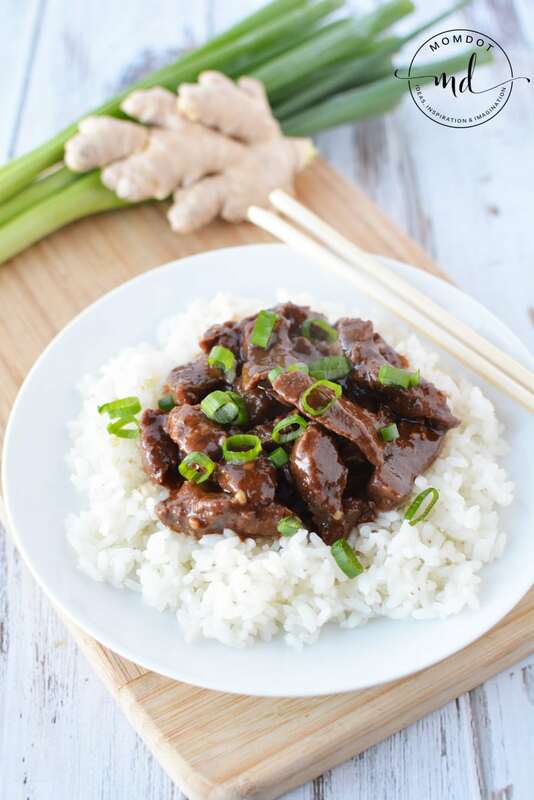 Mongolian Beef gets new life in this super easy Instant Pot recipe that will make even driving to PF Chang's not worth it. This instant pot recipe, with conversions for a slow cooker and a 30 minute stove top meal, is perfect no matter what you have going on in your kitchen. Yum! When cooking cycle is complete, quick release the steam and open the lid. Stir in the cornstarch and water mixture and let set for about 5 minutes. 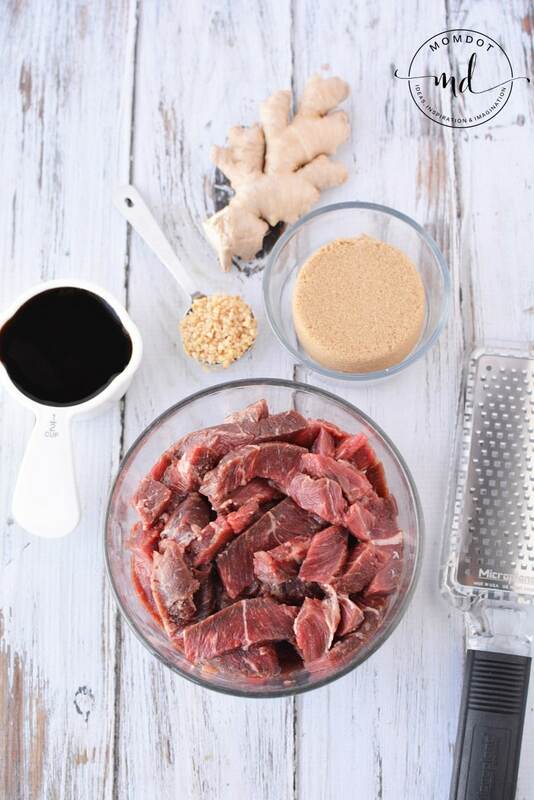 Of course a pressure cooker isn’t the only way to cook Mongolian Beef! You can also make Mongolian Beef (Just like PF Chang’s!) in under 30 minutes. Or take this tender flank steak and instead throw in a crock pot for this all day marination that will make your tummy rumble when you get home from work. No need for a take out when homemade is on the menu. If you love this, you may also love one of these 21 day fix beef recipes. Like most Asian inspired dishes, you need to fist toss your beef in cornstarch and lightly coat and set to the side. If your kitchen is warm, throw in the fridge for safe keeping. Now heat up your vegetable oil in your cast iron pan, with your garlic and ginger. Soon your kitchen will be fragrant and tasty on its own! This is the part my kids always walk in and ask whats for dinner. Add water, soy, and brown sugar, stirring carefully until mixed and bringing to a simmer. Stir slowly for approximately 2 minutes and move off heat. Time for the beef! Add your oil to your wok and heat on medium-high. Now fry up your beef until brown on both sides, which will take just a few minutes rotating it. Do not add beef on top of each other and instead you may need to break this down and do groups of beef at a time until all day. Remove beef and set to drain. Add beef into your sauce together and mix up. This will allow your delicious Mongolian sauce to coat your beef! Reheat your sauce and beef just enough that its warm and thick. Serve asap and watch it become an easy but yummy meal for your family! Love this recipe but low on time? 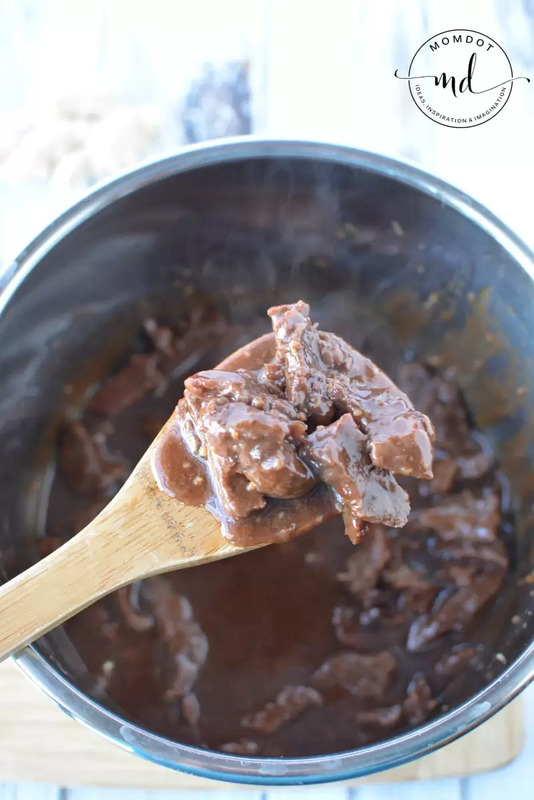 You can also make this in the slow cooker with a few alterations! 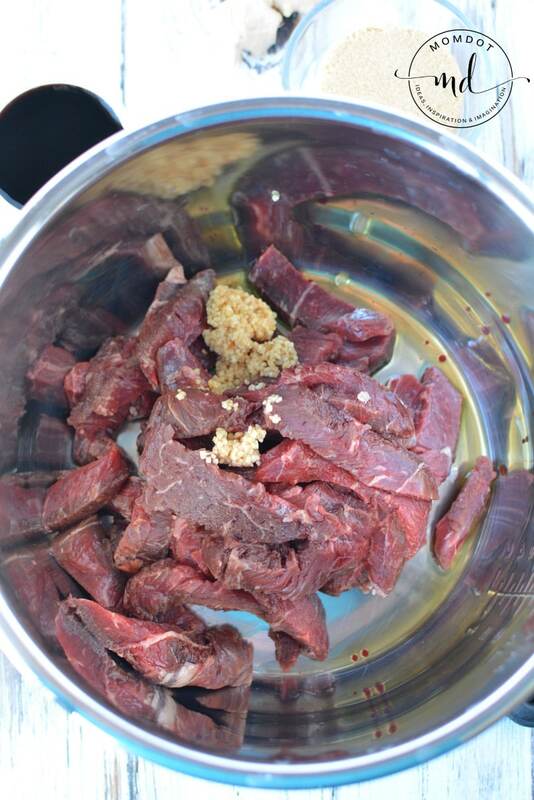 Starting with your flank steak, cut in the grain into small stripped pieces. Now dip your slices into cornstarch and cover fully on both sides. Meanwhile in your crock pot, add your olive oil, garlic, soy, water, and brown sugar and mix. Add your beef to your crock pot and coat with ingredients. Slow cook for approx 4.5 hours until beef is well done and serve over jasmine or fried rice. I love instant pot, Mongolian beef sounds great, I gotta try this! Oh wow! I love the instant pot AND magnolian beef! Can’t wait for this one! I’m loving everything in the IP these days. I just pinned this one to make it next week!